WARNING: THIS PRODUCT IS NOT MEANT FOR SUB OHM DEVICES. THIS IS ONLY FOR USE IN MOUTH TO LUNG DEVICES (PEN STYLE DEVICES). It's also very important to be careful with strong nicotine salt juice, especially in higher powered vape devices. It's easy to overdo it so please use caution. This product should not be used while driving. Please get accustomed to this product on a low dosage level before moving to a higher strength. This is not normal (freebase) nicotine and should only be used if you have thoroughly researched/ used nicotine salts before. 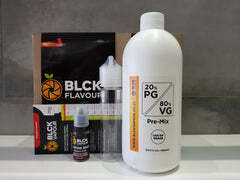 **The VG is just the carrier for the nicotine, you will still need separate PG and VG to make your e-liquid mix.